Corporal Gruber saw the German squad breaking into the stone structure to the right of the post office where the Russians dug themselves in. He grabbed the demolition pack and dashed out into the street. How he ran through the bullet storm and across the street was beyond anyone’s guess, but the German squad must be keeping the Russian distracted. Some of the Russians saw the lone figure coming and got off a few shots nonetheless. Jaws were dropping all around as Gruber, still unscathed, managed to place the demolition pack. 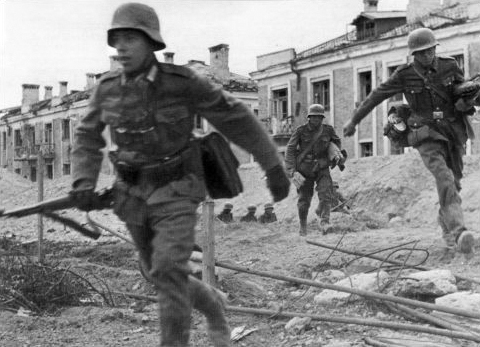 The Russian squad, already being shot up by the Germans dropping in from the right, was looking to run. The blinding explosion that ensured took out half the Russians and made a firm decision for the rest : run! This entry was posted in Game Play and tagged Advanced Squad Leader, ASLSK, Board Game, gaming, S2:War of the Rats, scenarios, Stalingrad, wargame, World War II. Bookmark the permalink.